This is actually the second blues upcycled top. I decided to go ahead and show it today. This one finished at 100 x 100". I named it Periscope because it reminds me of a periscope where the courthouse steps blocks some together and leave a space for the big block of fabric. You could also put a pieced block instead of a simple 12" square of fabric, but I thought a pieced block actually took away from what I was aiming for - believe me, I played around with putting one there (in EQ program). 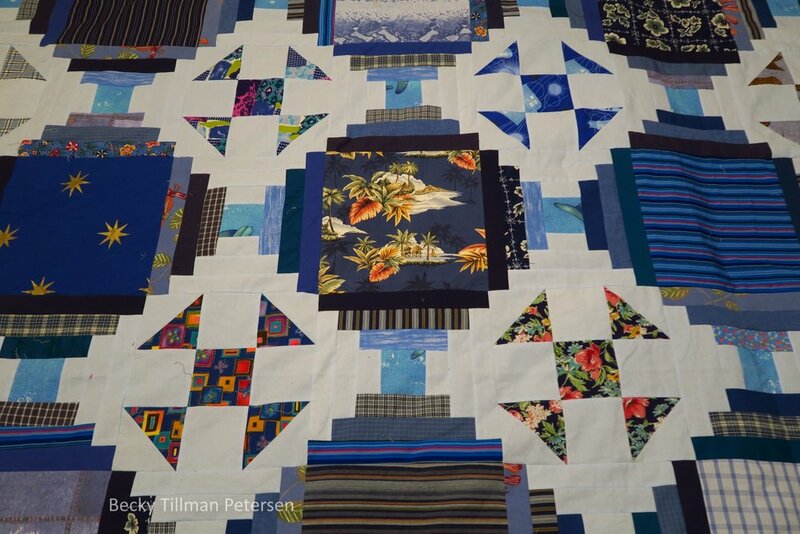 But, if a person had 12 BOM (block of the month) quilt blocks, for example, if you had carefully coordinated the rest of the pieces of the courthouse blocks, they could nicely frame your BOM blocks. Just to provide some interest, though, I put some other blocks in the empty spaces. In the end, I was very pleased with this one. I know some people don't like to leave such a big piece of fabric (12") as I did, uncut. But I'm fine with it. I came into "patchwork" too late in my life (in my 40's) to have any presuppositions about what should or shouldn't be. I actually finished this top on the 12th of November - so over 2 weeks ago. As I'm working with my plastic tubs of blues, I can't help but look back at these large pieces and say "Wow!" I don't have any 12" square pieces left - at least not of any interesting prints. So, I guess I have made good progress at whittling down my boxes of blues. To remind you, this is number 2 - number 1 was "Starring Monkey Wrenches" and number 3 was "Premium Labels". This one slots right in the middle of those two. I do have 2 more tops finished - numbers 4 and 5, which I'm working on patterns before I show you, and now I have numbers 6, 7 and 8 started - at least some pieces cut PLUS the crumbs one that I showed over the weekend. Maybe at the end of these three, I'll finally be able to get those lids on TWO boxes of blue upcycled pieces to close. Until then, I'll keep going. With number 8, I'm adding another color, however. I'm getting a little tired of blues and blues and white or blues and creams. I know that many of my blue pieces have other colors in them, but by top number 6, my pieces of blues are getting a little less than inspiring. You'll see. Hopefully the finished tops will be fine even if the fabrics themselves are a bit on the boring side! Sad news on the "blues" front. Well, sad, from one perspective, and not sad from another. I found another rather large bag of unboxed upcycled blues! Yes, the bag held mostly greens and blues. I don't know for sure where it came from. I think it came from a pile that I uncovered while looking for something else. At least the items are all taken apart. I guess I just didn't have anymore room in my boxes, so I just put them in a bag and put it somewhere. Many of the pieces in the bag were more of what I've already been using, however. There are a few new fabrics, however, so I'm happy about that. But what it means is that, for sure I will be able to make at LEAST one or two MORE after I finish 8 or 9 tops. Yikes. That's a LOT of blues! I've been working on the pattern and it is here. I hope someone can use it. It was a very fun quilt for me to make - it was fast and I really like how it turned out! As I write this, we're having some snow. We'll see overnight if any actually accumulates. The birds outside my window are surely appreciating the food I've been giving them though! Plus, the birds who are actively feeding gives my invalid husband something to look at as he lies on the bed. He is getting up to go to his office from time to time, though. And don't forget if you need something for your winter quilting projects - it's a great time to check out what my sis has for you over in the store!